STAHLWILLE - einer der führenden deutschen Werkzeughersteller, Spezialist für Drehmomenttechnik: NEW: 19-piece set of sockets 40/16/3QR SCI 1/4"
NEW: 19-piece set of sockets 40/16/3QR SCI 1/4"
The greatest. When it gets tight. Minimalist design. The 1/4" QuickRelease fine-tooth ratchet with the steel handle facilitates use even in awkward spaces. 80 teeth and a ratchet angle of only 4.5° make work that much more efficient. Maximum effect. 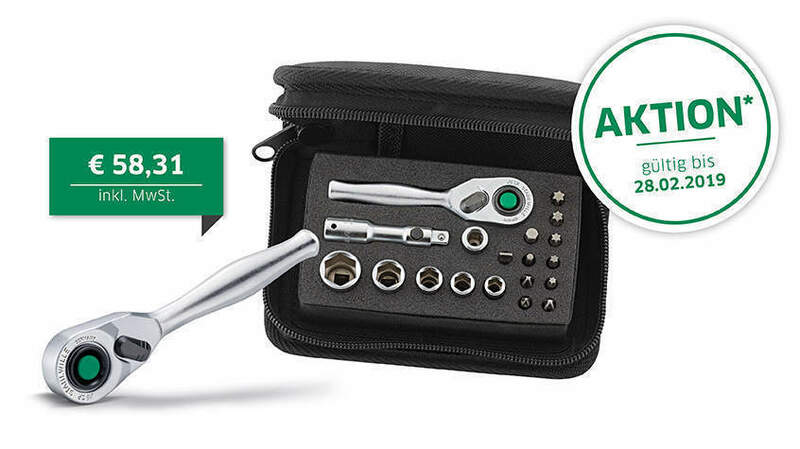 Although designed to be extremely compact, this 19-piece set includes the most crucial supplements such as an extension, bit holder and bits (slotted, PH and TORX). Perfect for most common working scenarios. Smooth operator. Unrivalled smooth action, even when applying high torques – thanks to the precision engineered bearing and resilient mechanisms. Robust. The special-purpose fabric, reinforced zip and durable seams make these tool wallets extremely resilient. Tools are well protected by the special-purpose hard-foam inlay. The AS Drive® profile provides extremely good force transmission without stripping the edges off the nuts and fasteners. The QuickRelease safety lock enables rapid tool changes and secures them reliably during work operations. Only 9 cm long, the steel-handled version is the perfect assistant in particularly confined working spaces. The 80 teeth and ratchet angle of only 4.5° ensure efficient working. *Offer valid until 28 February 2019 but only within Germany and only through participating STAHLWILLE specialist dealers.